Located at the foot of the Rocky Mountains, the city of Boulder is a leading force in arts, culture, and entrepreneurship—a place where creativity happens. 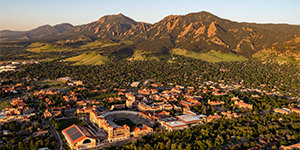 At the heart of the city, CU Boulder produces some of the nation’s top innovators in these realms and is a major hub for the artistic community on the Front Range. Our talented faculty, students, and alumni are leading the way for the next generation of original thinkers. Our emphasis on a customized education combined with our dynamic academic programs, hands-on learning opportunities, and rigorous course work are at the cornerstone of the CU Boulder student experience. 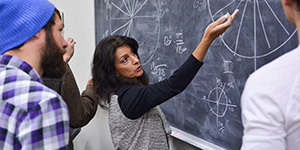 Within our supportive learning community, you’ll interact with our faculty—including Nobel Laureates, MacArthur Genius Grant Fellows, US Professor of the Year awardees, and National Medal of Science winners—who will be listening, questioning, and helping you refine your ideas so you can develop a broad understanding of the world, strong leadership skills, and an enhanced ability to think critically. The College of Music is one of the country’s top public Music programs. Our talented and active faculty of musicians, composers, and scholars teach an impressive series of programs. Students can choose from several undergraduate and graduate degrees in more than 23 fields of study and elective certificates in Music Technology and Entrepreneurship. The College’s distinctive combination of core educational programs with professional experiences prepares students for success. Ensemble experiences include concert and jazz bands, choirs, and symphonic orchestras as well as chamber groups, pioneering world music ensembles, and a state-of-the-art laptop orchestra. Musical events range from fully staged operas to early and new music performances. The rich resources of a leading research university, providing students access to the liberal arts and numerous interdisciplinary opportunities, enhance this intensive musical training, and the close interaction with faculty equips students to develop their talents, refine their passions, and ultimately succeed in their professional endeavors. • Faculty and alumni have received more than 30 Grammy awards and nominations. • More than 150,000 volumes, score recordings, and periodicals are in the College’s music library. • 400 public concerts are presented annually by students and faculty. • The student-faculty ratio is 6:1. The Department of Theatre and Dance fosters artistic discipline, exploration, creativity, and interpersonal communication. The undergraduate programs provide a balance of theory and practice through which students gain knowledge, critical insights, and performance skills. The department encourages production of student work and involvement in activities ranging from participation in productions to presentation of individual creative work. The Bachelor of Arts in Theatre offers academic courses and training opportunities in all aspects of theatre. For students with a wide range of interests and those who are considering double-majoring, the Theatre program is ideal. For highly talented students who aspire to professional careers in theatre, there is a more specialized and rigorous curriculum leading to a BFA. Students may choose among concentrations in Performance, Design and Technology, Stage Management, and Musical Theatre. Our exciting and diversified Contemporary Dance program values and provides study in a range of styles and fusion of forms that influence and reflect the multifaceted nature of concert dance today. The curriculum, which leads to a BA or BFA, develops concrete skills in performance and choreography and instills an appreciation of the role dance plays in human culture around the world. CU Boulder is the home of the internationally renowned Colorado Shakespeare Festival (CSF), one of two University-based groups in the world to have completed the entire canon of 37 plays. Full-scale productions of the Bard’s work are presented on campus each summer in the beautiful outdoor setting of the 1,000-seat Mary Rippon Theatre and in a 420-seat indoor theatre. Each year, actors, technicians, directors, and designers are selected from national and local auditions to be in the CSF Company. There are also numerous off-campus and summer production opportunities. The CU Moving Company tours statewide, and the Theatre Outreach Tour travels the state each spring. Students also work regularly with the CSF as actors, technicians, and dramaturgs. At CU Boulder, the hard work happening in our classrooms, labs, recital halls, and studios is passionately balanced with enjoying the beauty that surrounds us. Appreciation for our iconic Rocky Mountain locale comes easily in Boulder. 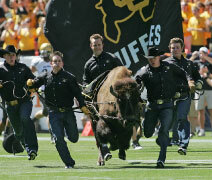 As a result, we have one of the most active college campuses in the nation, where recreation, sports, and student groups play key roles in the unique CU Boulder experience. Within our inclusive community, you’ll find many ways to get involved and make lifelong friends. And you’ll have the opportunity to serve the greater good through volunteerism and civic engagement, whether it’s around the world or across the street. CU Boulder graduates continue to Be Boulder as they enter the workforce or begin their graduate school education. With their hands-on experience, world-class education, and ability to think critically, globally, and creatively, they benefit from a strong salary potential, high employment rates, and the opportunity to find and excel in a career they’re passionate about. • 74% of CU Boulder graduates are accepted into their first-choice graduate school. Live in spectacular surroundings and immerse yourself in a campus environment of extraordinary opportunities. Come to CU Boulder and discover who you can be.